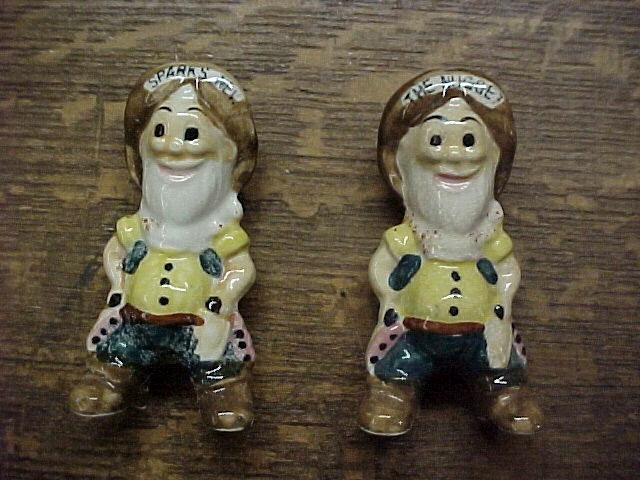 1930's 4"inch Porcelin Salt and Pepper Shakers of Gold Miners, with their hands on their guns and the name "Sparks Nev." on the hat of one and the words "The Nugget" on the hat of other. They still have the original stick label "Japan." This dates them pre-1940 and they are in mint condition and very rare. 1930's 4"inch Porcelin Salt and Pepper Shakers of Gold Miners, with their hands on their guns and the name "Sparks Nev." on the hat of one and the words "The Nugget" on the hat of other. They still have the original stick label "Japan." This dates them pre-1940 and they are in mint condition and very rare. Please email cowboycabin@centurytel.net with questions or call 406 270-2842.